The only world leader who from the start saw Iran's intentions and the danger posed by ISIS was Israeli Prime Minister Binyamin Netanyahu. These forces were more than instrumental in defeating the Sunni-led rebellion against President Bashar al-Assad and helped the Syrian army in regaining control over roughly 60 percent of Syria’s territory. Today, Assad again controls virtually every major population center in Syria. However, he has not yet been able to win the battle with Islamist rebel groups who still control the Idlib Province in northern Syria and routinely stage attacks on Assad’s forces in other parts of western and northern Syria. The Syrian dictator warned during a speech on February 18 that he is still far from restoring his rule to pre-war level. “We have this romantic view sometimes that we are victorious. No, the war is not over,” Assad said. The Syrian tyrant realizes he has been reduced to a puppet of Tehran and Russia and is feverishly working to restore ties with Arab countries. At the same time, Assad has made clear that he will do nothing to stop Iran’s plan for the annihilation of Israel and is in favour of future military action against Israel from Syrian soil. Soleimani earlier founded the Golan Liberation Brigade, a predominantly Shiite militia from Iraq, which is currently recruiting disgruntled Sunni’s in the Kuneitra and Daraa Provinces in western Syria. On Monday, the IRGC organized a meeting in Damascus involving Iraqi and Syrian military officials who will discuss the opening of border crossings on the Syrian Iraqi border and the completion of the land bridge. Chief of General Staff of Iran’s Armed Forces Major General Mohammad Hossein Bagheri is leading the talks which aim to achieve military and economic cooperation between Iran, Iraq and Syria. Upon arrival in Damascus, Bagheri warned foreign forces to get out of Syria and claimed their presence in the country was illegal since they were not invited by the Assad regime. The Iranian general said the issue would be an important topic on the agenda. Bagheri’s comments came as the Russian media outlet Rambler reported that Iran is negotiating with the Assad regime about Iranian control over a container port in the Latakia Province. The Iranian attempts to establish a foothold in Latakia could set Tehran on a crash course with Russia, which has several bases in Latakia and is leasing the port of Tartus from the Assad regime. Iran claims its attempts to establish a foothold in Latakia are meant to improve its economic stature in the region, but it’s clear that the move is related to Tehran’s post-war plans for Syria which ultimately should help it to confront Israel. Iran is currently helping Hezbollah to modernize its missile arsenal which largely consists of crude missiles. Iran is smuggling the necessary GPS equipment for transforming missiles by way of suitcases on civilian flights to Lebanon. The GPS kits are relatively small making the delivery to Hizbollah virtually without risk because the IAF will not carry out attacks on civil aircraft or civilian airports to make delivery impossible. The GPS equipment enables Iran and Hezbollah to convert 14,000 Zelzal-2 and 3 missiles into precision weapons. Hezbollah’s missile arsenal is estimated on 140,000 projectiles, among them also Scud rockets. Bayt al-Maqdis is Arabic and Farsi for the words Beit HaMiqdash in Hebrew, the name for the Temples built by King Solomon and King Herod. Also last Thursday, it was revealed that Hezbollah is collaborating with Iran to build terror infrastructure on the Syrian Golan Heights. Hezbollah commander Abu Hussein Sajid, a terrorist who was sentenced to life imprisonment by the United States for murdering American soldiers in Iraq but was released after five years by the Iraqi government, leads the military build-up on the Golan Heights. Sajid has recruited hundreds of Syrians to form a new brigade on the Syrian mountainous plateau. The brigade will be equipped with automatic weapons, explosives and anti-tank missiles and will most likely take part in a future multiple-front war against Israel. Hizbollah's military capabilities have increased significantly as a result of the war in Syria and are now estimated as 100 times higher than what the Lebanese terror organization had during the war with Israel in 2006, a senior Iranian official said on Wednesday. 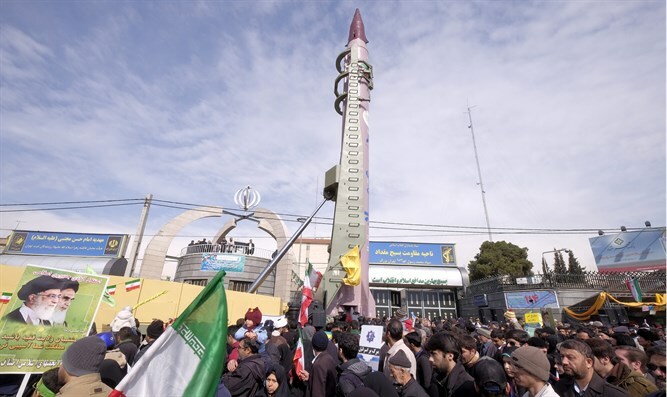 The Israeli company ImmageSat International, furthermore, revealed that Iran has built a new plant in northern Syria where precision missiles are assembled, intended for use against Israel in the future. The plant is located in Safita in northwestern Syria and is only eight kilometers away from the border with Lebanon. The only world leader who from the beginning saw this coming was Israeli Prime Minister Binyamin Netanyahu. The Israeli leader relentlessly warned against Iran’s entrenchment in Syria and was one of the first world leaders who recognized the threat ISIS poses to the free world. This even earned him the praise of Ha’aretz analyst Anshel Pfeffer - not exactly a fan of the Israeli PM - who came to the conclusion the Netanyahu "outfoxed" not only Iran but also Russia and ISIS.